LIQUI-MOLY Bathurst 12 Hour runner-up David Calvert-Jones has spoken about his desire to return to Mount Panorama next February. 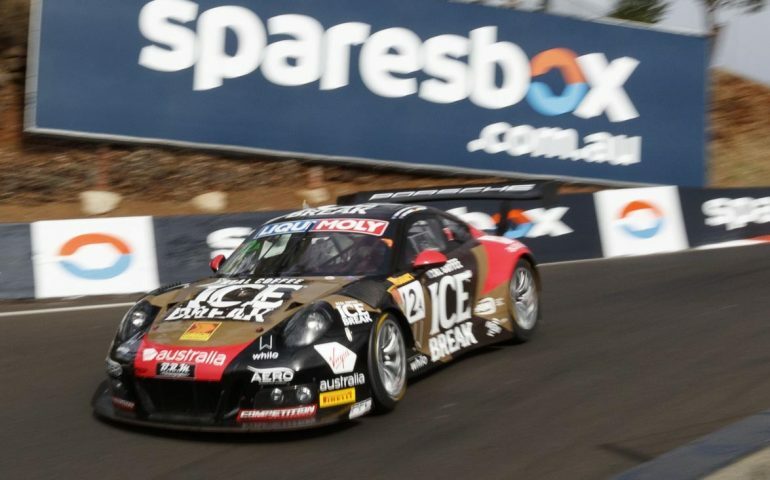 The US-based Australian expat teamed with Porsche works drivers Marc Lieb, Patrick Long and Aussie young-gun Matt Campbell to finish second behind the winning Maranello Motorsport Ferrari 488 GT3 this February. The team was a consistent contender throughout the weekend, ending regular qualifying in fourth place before a solid lap in the shootout saw Campbell bank the 9th fastest time and secure a place on the fifth row of the grid. Despite multiple pit lane penalties, strong strategy and consistent driving from all four drivers saw the car remain on the lead lap for a majority of the race. The car looked on course for third – one lap down – in the closing stages before the Scott Taylor Motorsport Mercedes AMG GT3 crash elevated them to second within the final 20 minutes. Not only did the podium represent the quartet’s best ever results in the race, it also secured them the BRM Chronographs Pro/Am Class victory. “It was a thrill and a long-time dream of mine to stand on the Bathurst podium, let alone to win the Pro-Am Class,” Calvert-Jones told Bathurst12hour.com.au. “2017 was my fourth time at the race and to team up with Patrick, Marc and Matt was amazing. We went into the race focusing on the Pro/Am class with the knowledge that if we went well in that, we would go well in the outright standings and that was very much the case. The Ice Break Porsche’s result was also the best ever for the German brand in the race, beating home the factory-supported Walkinshaw Racing entries in the debut for the type-991 GT3R in the race. ‘CJ’ has accrued a strong record of Bathurst results across his four starts, with previous efforts at Bathurst including an 11th outright finish in 2015 when sharing with Long and Chris Pither in a previous generation 997 GT3R. He and Long paired with Alex Davison to finish second in Class B the year prior, while his debut in 2013 resulted in a non-finish. Queensland-based McElrea Racing has run Calvert-Jones’ Porsche in it’s Bathurst 12 Hour campaigns, while the car is based in the United States. It – still in Bathurst 12 Hour livery – and Calvert-Jones recently appeared in a Porsche USA promotional film comparing the GT3R race car with the brand new 991 GT3 road car. Ticket and Camping sales are underway for the 2017 event, with early-bird pricing running until the end of August.